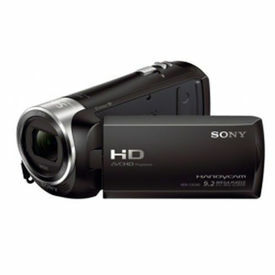 The black PAL format 64GB HDR-PJ820E Full HD Handycam Camcorder with Built-in Projector from Sony captures Full HD 1920x1080 video at 25p and 50p, as well as 20-megapixel still images. 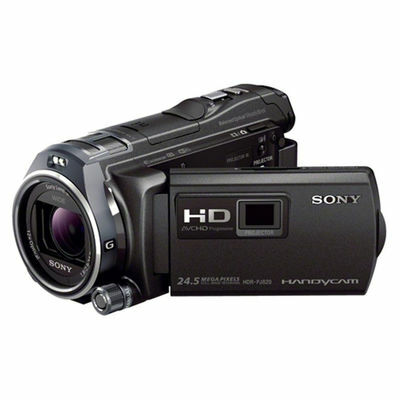 The signal format can also be changed to allow for Full HD 24p recording. 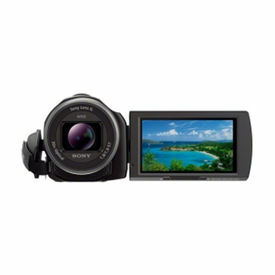 The camcorder features a 1/3.95" Exmor R CMOS sensor, a wide-angle Sony G zoom lens with 12x optical zoom plus 24x Clear Image Zoom, and provides 64GB of internal flash memory for up to 8 hours of recorded video. The camcorder delivers smooth shots even on the move with its Balanced Optical SteadyShot image stabilization technology with Active Mode. For enhanced connectivity and control, built-in Wi-Fi with NFC support lets you use your smartphone or tablet to control the camera, as well as wirelessly transfer files to your mobile device for sharing, and back up data on your computer. The HDR-PJ820E includes a built-in 50 lumen projector with auto keystoning that allows you to project video at up to a 200" diagonal size. You can also monitor and playback footage on the 3.0" Xtra Fine LCD touchscreen display with 921K dot resolution, or the 0.27" color EVF. For increased flexibility, you can record video in high-quality AVCHD, web-optimized MP4 files, or choose to record both simultaneously. The built-in microphone lets you capture 5.1 channel Dolby Digital sound. Enhanced manual controls let you get the most out of the camcorder. The assignable dial allows for control of focus, exposure, white balance, iris, and shutter speed. A built-in USB 2.0 cable provides a connection to your computer for charging or file transfer and fits conveniently into the hand strap, so it's out of the way until you need it. A rechargeable lithium-ion battery pack, USB AC adapter, HDMI Micro cable, step down ring, and a USB connection support cable come included. Also included is a RMT-835 Remote Commander with battery. 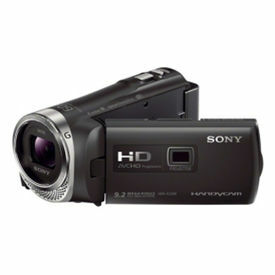 The black PAL format 64GB HDR-PJ820E Full HD Handycam Camcorder with Built-in Projector from Sony captures Full HD 1920x1080 video at 25p and 50p, as well as 20-megapixel still images. The signal format can also be changed to allow for Full HD 24p recording. 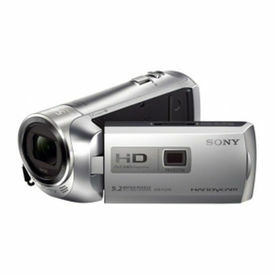 The camcorder features a 1/3.95" Exmor R CMOS sensor, a wide-angle Sony G zoom lens with 12x optical zoom plus 24x Clear Image Zoom, and provides 64GB of internal flash memory for up to 8 hours of recorded video. The camcorder delivers smooth shots even on the move with its Balanced Optical SteadyShot image stabilization technology with Active Mode. For enhanced connectivity and control, built-in Wi-Fi with NFC support lets you use your smartphone or tablet to control the camera, as well as wirelessly transfer files to your mobile device for sharing, and back up data on your computer. The HDR-PJ820E includes a built-in 50 lumen projector with auto keystoning that allows you to project video at up to a 200" diagonal size. You can also monitor and playback footage on the 3.0" Xtra Fine LCD touchscreen display with 921K dot resolution, or the 0.27" color EVF. For increased flexibility, you can record video in high-quality AVCHD, web-optimized MP4 files, or choose to record both simultaneously. The built-in microphone lets you capture 5.1 channel Dolby Digital sound. 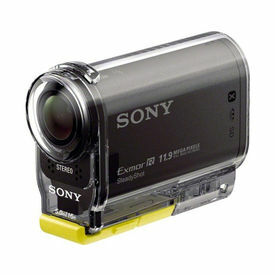 Enhanced manual controls let you get the most out of the camcorder. The assignable dial allows for control of focus, exposure, white balance, iris, and shutter speed. A built-in USB 2.0 cable provides a connection to your computer for charging or file transfer and fits conveniently into the hand strap, so it's out of the way until you need it. A rechargeable lithium-ion battery pack, USB AC adapter, HDMI Micro cable, step down ring, and a USB connection support cable come included. Also included is a RMT-835 Remote Commander with battery.